WELCOME IN THE NEW YEAR AND JOIN US FOR A SPECIAL DOUBLE SILENT DISCO YOGA EVENT!!! Our UPLIFT class will be the first session of a two part special and will involve what you already know and love about our Silent Disco Yoga Sessions. Think Vinyasa flow yoga building energy through movement and the sound of deep house music beats.This will be immediately followed by the MEDITATION session. Check out our other event for details of what to expect from this amazing class! You can come along to the classes individually or why not book yourself in for the double! What could be better than laying out comfy on your mat and listening to Stretch’s calming voice guide you through a meditation with soft music playing through the headphones? The specialised headphones are provided as long as you book ahead to reserve and you’ll be able to hear both the music and Stretch’s voice to guide you through the class. 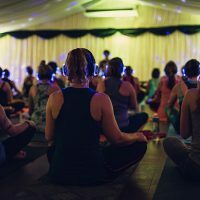 Building on the success of our Silent Disco Yoga sessions on the Cornish beaches and at the Eden Project, we wanted to bring you something equally amazing. The classes will be held in the beautiful Marquee space at the Carnmarth Hotel, on Headland Road at North Fistral! Use the postcode TR7 1HN to find your way and plenty of parking is available around the immediate area. Beginners and children (supervised) are very welcome. Some mats will be available to rent for £2 or feel free to bring along your own.